The product is resistant to high temperature, acids, alkalis and corrosion. It is used for screening in mines, coal factory and at construction sites. 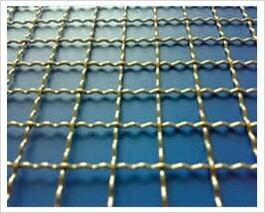 Specifications: • Material: high carbon steel / stainless steel • Wire Diameter: 1-12 mm Pre-crimped Weave Styles of Wire Cloth Weaving Pre-Crimped wire mesh is made of wire Dia (6G to 18G). It can be used for windows, Verandas, Partitions, Counter Shelves. It has several industrial uses like heavy screaning & Sieving of coal mines etc. In the pre-crimping process, wire is first formed (crimped) in precision machines using rotary dies that precisely define the spacing of the wires and insure that the wires will lock firmly together at the intersections. The pre-crimped wires are then assembled in custom designed screen assembly machines (looms).